An emerging pattern – leaving it until the end of the month. However it was planned. We just prayed that it did not rain on the day. Tignes opened for the summer season in mid June. Daughter number one decided that she wanted to come with me – no doubt it would be something cool to talk about with her friends. I’d skied in Chile in June & July many years ago, but this was to be my first experience of skiing in the height of summer. We set off early-ish. Annecy was gorgeous in the early morning light. We stopped in Albertville for an expresso and arrived at Tignes around 10am. By the time we hired skis for daughter we just missed the 10.30 train up the mountain. There was also a steady stream of skiers coming down the mountain. The lifts open at 7.15 and close at 13.00. We will know next time. By the time we got up the snow was a bit heavy. It was warm and sunny so we elected to ski in t-shirts. For some reason we were the only ones doing so. Why the heavy ski jackets everyone? The top of Tignes is at over 3500m and you certainly notice the altitude – that and the heavy snow meant that it was quite tiring. Its a different scene in the summer – there were lots of ski racers in serious training. There were also lots of skiers practicing aerial tricks. We had to make a detour so that daughter could check out if there were any hot ones. Ski resorts in the summer are pretty depressing places, with big scars on the landscape where the slopes have been made smooth. However, it is rather a thrill to head up out of 25degrees green lush countryside and emerge into the winter landscape. Both times to Les Grands Montets at Chamonix. May was always going to be the tricky month – a poor ski season and I would have had to make an expensive trip to Zermatt or Hintertux in Austria. Les Grands Montets is north facing, high and usually stays open into May. By the end of April most lifts in the Alps had closed, even though there was plenty of snow. Les Grands Montets extended its season until the middle of May but could have stayed open later. Both times I went the car park was full with cars from France, Switzerland and Italy. Both days were hot and sunny. The second day, a week later was rather a carnival atmosphere with the area at Lognan set up for people to ski over a water bath as well as lots of fun and games and music. There were many people up just to soak up the sun and atmosphere. The snow was in great shape early on, but was getting a bit soggy by mid afternoon. Les Grandes Montets is a quite awesome place. I did a bit of off-piste but not from the top cablecar as the queue was horrendous, and anyway I wasn’t so confident of finding my way down past the glaciers edge. I must get G to take me again next winter so I learn the way. I definitely left it a bit late this month – almost failing in the supposed easy part of the year. A combination of work trips and poor weather early in the month (I am a fair weather skier) led to this last gasp effort – but what a day. Daughter number one decided to come with me. It took some persuasion to get her to consider Flaine (rather than Les Contamines which is her favourite), but it was a great decision. Clear blue sky, slopes to ourselves, and excellent snow on the northish facing slopes. 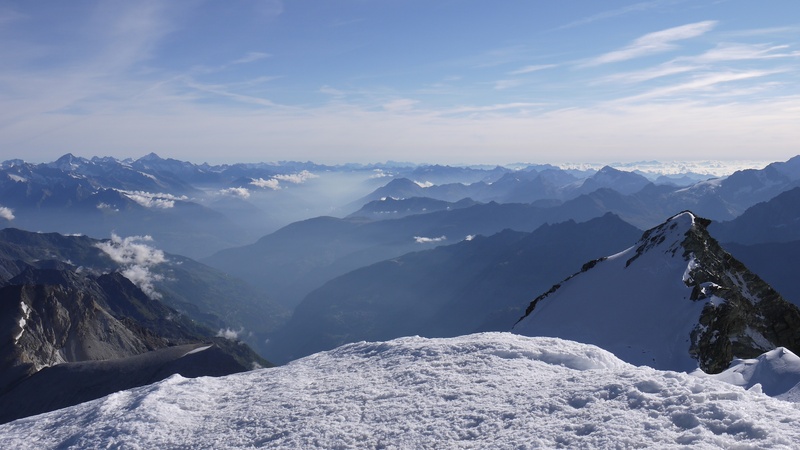 The view from the top onto Mont Blanc is absolutely spectacular. Daughter decided that we had to ski every run from top to bottom without stopping – this was exhilerating – we did it at fast speed with her usually in front. It could only go on so long though and after lunch we ended up skiing at a more normal pace and taking rests – the legs were burning by mid afternoon. Lunch was a great affair. I wish I could remember the restaurant (am writing this in July…). Anyway its the restaurant that has the aerial shot of it on the website. A band with double bass, guitar, drums and various percussion played french rock music as we ate rather a nice meal. No wonder the skiing was more sedate thereafter. It rained all day Tuesday, so reasonably fresh snow for Saturday was guaranteed. Saturday dawned with a blue sky and there was an expectant buzz as everyone waited for the train. I’d been advised to get to the platform early as the queues were likely to be long, and indeed there was a carefully set up system, with everyone waiting politely, yet when the bullet train pulled in it was a bit of a scramble. I got a seat – just. It was my first trip to Japan, and after a week of meetings and seeing the inside of an office it was great to have the chance to see a bit of the country. I don’t normally add on personal time to work trips but when was I likely to be back in Japan, in the winter, and at a weekend?. This was definitely adding something to my challenge to ski throughout the year. The Shinkansen (bullet train) sped across the flat plain and there was an excited chatter inside. As we neared the mountains we entered a series of long tunnels and finally emerged at Gala Yuzawa into a blizzard. The chatter stopped and there was a moment of complete silence in the train as the shock sank in. Where did that snowstorm come from? A gondola takes you to the central ski area and from here a series of lifts fanned out. Due to the snow, only a half of the area was open, though it gradually stopped snowing, and by 1.00pm the whole resort opened and there were breaks in the cloud and great views in all directions. This was a different world to skiing in Europe – the noise levels were amazing – a resident DJ was blasting out music from the base station, which was relayed to speakers on all the pylons – there was no escape from motown (in the morning), cool jazz and then hip hop (in the afternoon). There were floodlights on, due I guess, to the gently falling snow, and people everywhere. Boarders were well represented. Most people skied at a slow speed, and I found myself taking a scything route through the crowds. The snow was fantastically light, though the pistes were narrow and fenced off, so no chance to go off piste. I heard one english voice all day, and choosing lunch involved pointing and nodding. In the afternoon I managed to inadvertantly break the system by skiing over the back of the resort and into another ski area. Here the slopes were wider and longer. I did 3 runs before they found an english speaking attendent who informed me that my lift ticket was not valid for this resort. Then it was back on the Shinkansen. Time for a quick sleep as it passed through the tunnels and arrived back in Tokyo 77 minutes later. Thanks to the folks at WeLoveSnow.com for arranging the tickets that made the day trip so easy. This week I bought some new skis, only my 4th pair since I started skiing over 30 years ago. K2 Apache Recon, 181 cm.. I’d spent 2 or 3 years hanging onto the belief that I could ski on my old 203cm K2s from a bygone era. Then last year I left them in the cellar and rented, taking pot luck on what the hire shop had, in order to learn about different ski types. I knew what I thought I liked. What I skied on best was something different. In December 2007 I skied on some K2 Apache Recon. They were sensational – I bought some. Lots of snow came in early December 2007, but by late December the slopes were getting a bit tired. I decided that I would not ski until there was more snow. Snow came this week and so the weekend was a definite possibility for skiing. I’d promised to go skiing with S, a family friend, and early in the week we started texting about skiing at the weekend. Sunday it was. She arrived at 7.30 at our apartment and at 7.40 we set off for Champery, the gateway to Portes du Soleil. We were on the cable car at 9.10. The day was one of blue sky, warm temperatures and snow that varied from hard packed (on the Swiss side of the resort) to powder and some slush in France. We did 20 runs, at high speed, going to Les Crozets, Champoussin, Avoriaz, and Chatel. We chatted non stop about our kids, spouses, life, friends, skiing and travel plans. The views were fantastic, the best run was the race course above Avoriaz – superb powder snow, hardly skied on. We arrived at “the Wall” on the way home, with tired legs and so declined the descent, taking the chair down. Prudence. The new skis turned out to be a good choice, matching my fast skiing on the cruising slopes whilst providing quick edge to edge turning on the steep stuff.